Happy New Year Cavemen Gourmet fans! Hope you all enjoyed the holiday season – it always goes by too fast doesn’t it?! This year my resolution is to cook (and post) more. Cut your squash in half and take out the seeds. Then place on a roasting pan and bake at 375 degrees for 60 minutes or until tender. 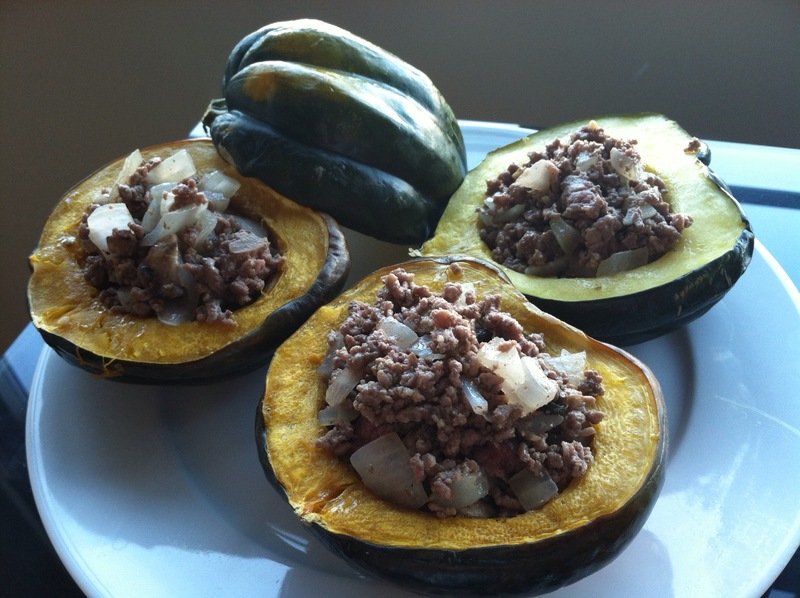 While the squash is baking – saute the onions and ground beef on medium heat with the other dry ingredients until browned. Once the squash is ready, stuff the squash with the beef filling and bake for another 15 minutes. Serve and enjoy! I have loved shisito peppers for the longest time but never thought to post them as a ‘recipe’ until I started seeing them on some New York restaurant menus. One thing I love about New York dining is the food trends. You know – the “IT” dish that spring up on every menu when a new hot spot opens up. There was the miso cod, then the lobster mac and cheese, then the oxtail and bone marrow dishes a couple of years ago. Heck, even the occasional vegetable made the list like ramps when the ‘farm to table’ restaurants couldn’t get enough of the stuff! Generally, I only saw shisito peppers on the menu of Japanese restaurants. Now – they’re white hot and I’ve seen them on dozens of menus in a variety of cuisines. They are without a doubt the easiest things to make. The only hard part is finding them in your local grocer because they’re somewhat hard to find. The peppers are great for an appetizer or the after school/work snack but just be careful to give them to kids. Typically, they are as mild as bell peppers but every once in awhile you get a spicy one that may not be good for children if they aren’t used to it! In a frying pan, heat to high and add olive oil. 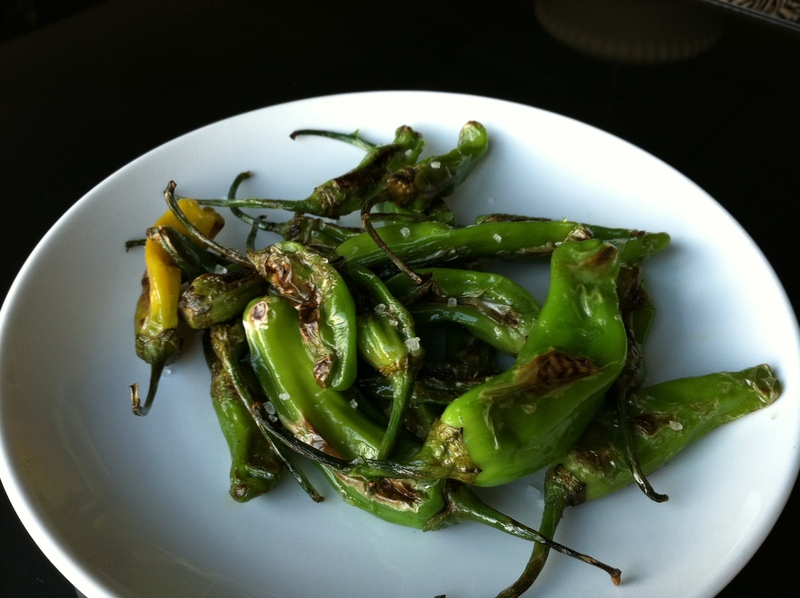 Toss in shisito peppers and mix in the pan until they are blistered, about 5 minutes. (I personally like my shisito peppers soft but feel free to sauté for less time if you want it a little bit crunchier). After the peppers have cooked, remove from the pan and transfer to a plate. Sprinkle kosher salt. Greetings from London! I have been traveling a bit and am reminded daily of how hard it is to eat well while on the road. This easy recipe is a great snack for any roadtrips or flights (especially with those dreadful airline meals!). As simple as this recipe is, you’ll love the amazing combination of texture and taste! First, peel your cucumbers. I like a tiny bit of skin on mine for the added texture but you can do however you prefer. Then cut your cucumber in half (not lengthwise!). Next, with a sharp paring knife, make an initial indentation lengthwise and start cutting the core of the cucumber out, creating a hollow log shape out of the cucumber. Next, core and slice your avocado in quarters. 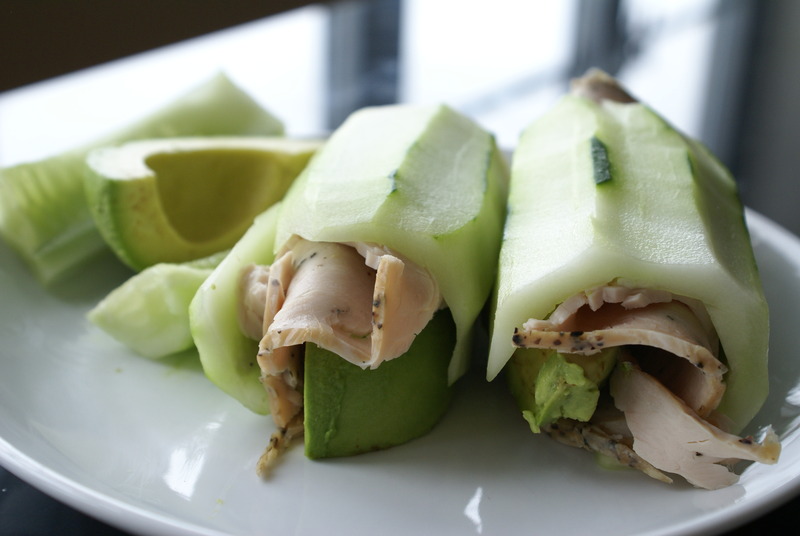 Once that is done – simple layer the turkey in the cucumber and place the avocado in the turkey. Voila! 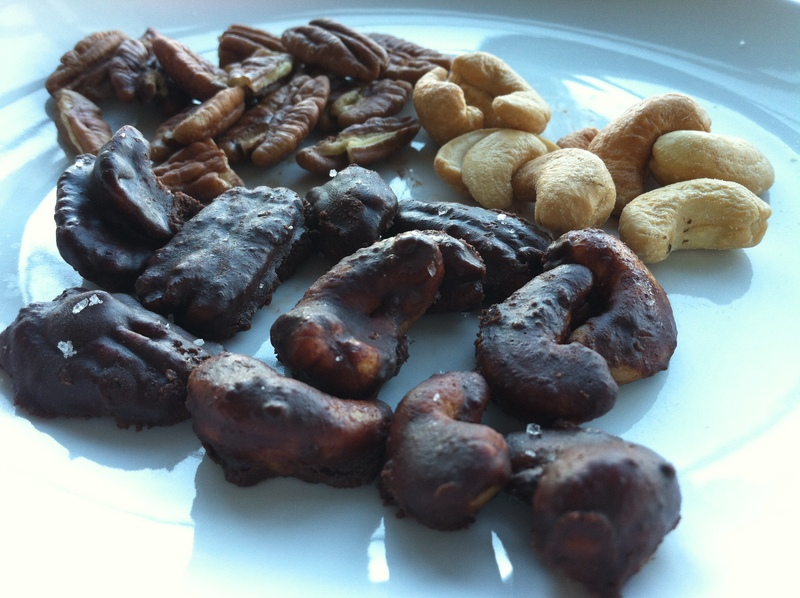 You have yourself a fresh, paleo snack that’s refreshing and delicious! Feel free to add some basil or other herbs to add more flavors. I keep this simple because my husband loves the basic saltiness of the turkey next to the crunchy cucumber and the creamy avocado. Combine olive oil, lemon juice, salt, onion powder, thyme, paprika and garlic in a baking dish. Add the lamb cubes, cover and refrigerate overnight. If you’re using wooden skewers – soak them in water for at least 30 minutes. This will prevent them from burning on the grill. 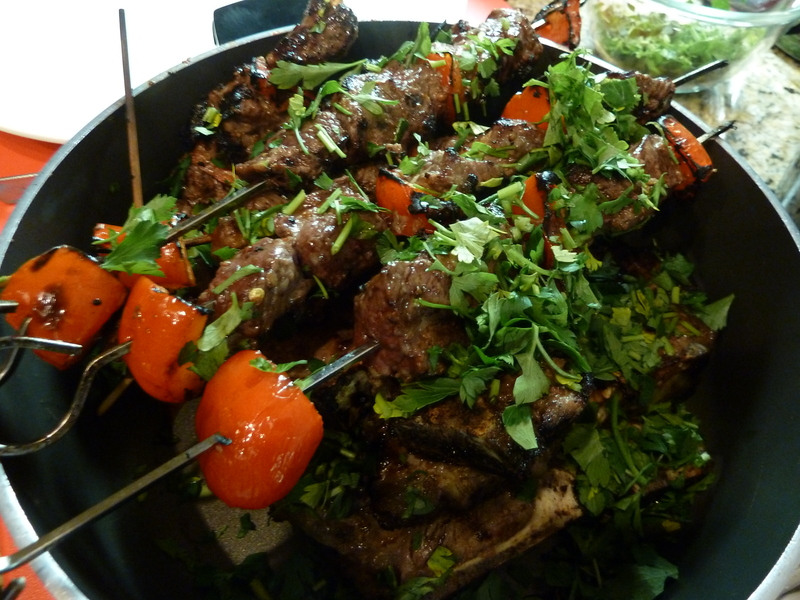 Drain your marinade from the lamb and start building your kabobs. Try peppers, onions, mushrooms, eggplant – whatever you want! We chose onions and red peppers for this grilling session. Once your grill is ready, place skewers on grill (or you can do in grill pan). I like my lamb medium rare so this would be just 4-5 minutes on high heat (about 125 degrees for medium rare, 130 degrees for medium, etc). Once the lamb is cooked to the level you desire, sprinkle the fresh chopped parsley on top. That’s it! Serve and Enjoy! This dish is very simple to make but great for that sweet tooth fix that my husband craves. Feel free to add raisins or apples or anything else to it. Most likely I’ll make several versions of this to see what works best but for now – I’ll keep it simple! 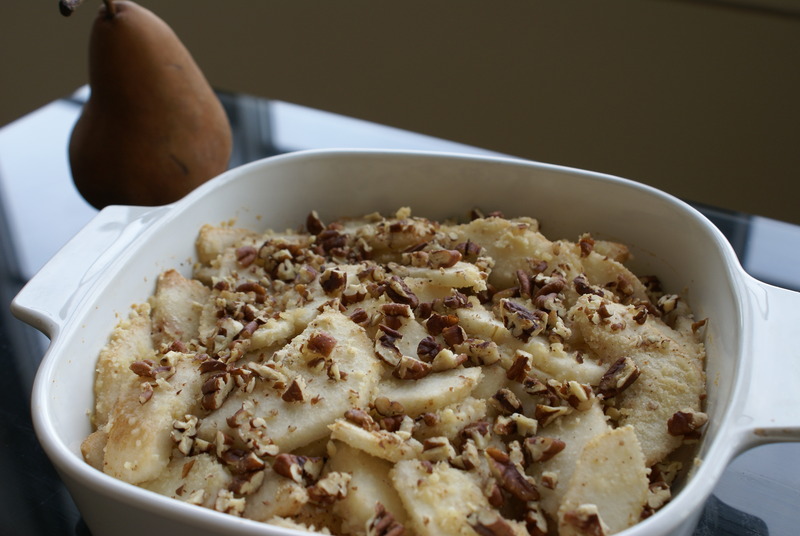 In a large mixing bowl, mix your sliced pears, coconut flour, shredded coconut, cinnamon and almond extract together. Then, in a separate small bowl, mix the honey and chopped walnuts together. In a medium sized baking dish, spray the bottom of the dish with your favorite cooking spray (sometimes I brush with a bit of walnut oil instead). Add the pears to the dish and sprinkle the walnut honey mixture on top. Bake for 20-25 minutes. You can serve hot or cold! Enjoy! Happy One Year Anniversary to Cavemen Gourmet! Thank you for all of the support and positive comments. 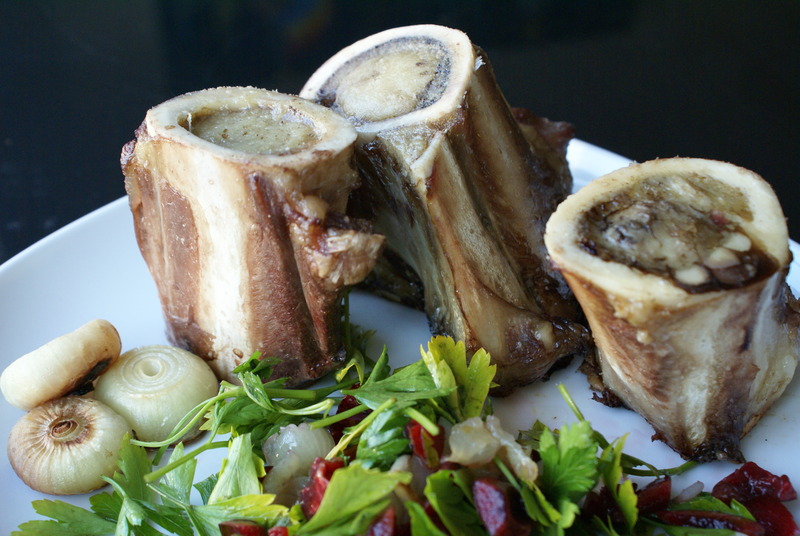 Hopefully I can make more time this year to post more delicious paleo recipes! I recently came back from London on a work trip and was inspired to make this dish. After a heavy meal I had at a work dinner, I decided to get something light for dessert and opted for a mango kiwi tart. I was amazed that it was just a bowl of the fruits mixed up and surprised that the simplicity of the two could be so delicious. Although it’s technically just fruit salad, this dish is an amazing combination of flavors and textures. 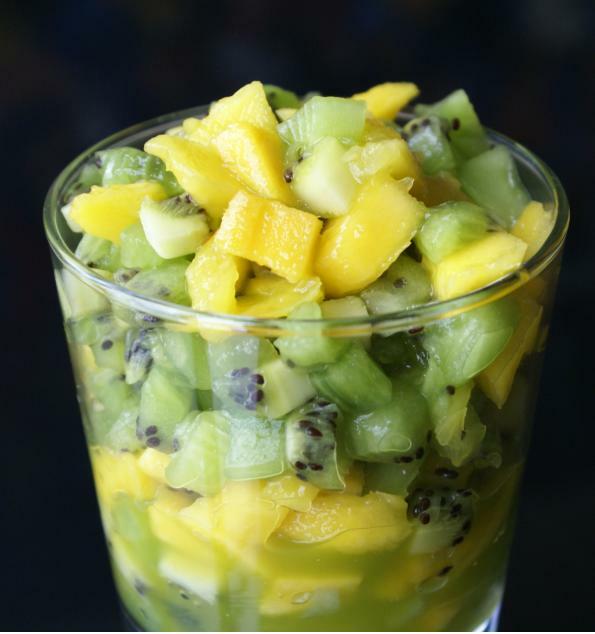 You can easily make this dish by sloppily chopping up kiwi and mango in 2 seconds. But something about dicing it ever so finely into tiny squares and the combination of sweet and sour makes this a perfect dessert ‘pudding’. The marriage of kiwi and mango flavors is surprisingly balanced and also provides a pudding-like texture after you mix the two thoroughly. Hopefully you enjoy it as much as I do! Peel both fruit with a sharp paring knife. Cut each fruit into small cubes (think the size of tomatoes in salsa). Mix thoroughly and put in refrigerator before serving. Best served chilled….enjoy the taste of summer! Note: this is also delicious if you add some coconut flakes or chips. Reminds me of a tropical vacation! I loved stuffed bell peppers. It’s one of my favorite dishes and my mother in law made some a couple of weeks ago which gave me an idea of making a paleo version. I modified her recipe by taking out the rice and it ended up being terrific. My husband raved about it and said it was one of the best things to come out of our kitchen. But I should caveat that with the fact that he says that with a lot of my dishes, so much so that he is starting to remind me of Ina Garten’s husband, Jeff, who takes a bite from one of Ina’s dishes at the end of a Barefoot Contessa show and always acts like he just took a bite out of heaven. But I’ll take a thumbs up any day. Cut the top of each bell pepper about one inch from the top and remove seeds in the center. Add the bell peppers in a boiling pot of water for 4-5 minutes until tender. Drain and set aside to cool. In a large pan on medium heat, saute your chopped onions and mushrooms for roughly 5 minutes until browned. Add ground beef and stir until lightly browned, not fully cooked. Reduce heat to low and then add the minced garlic, tomato paste and diced tomatoes and stir thoroughly. In a medium sized baking dish, line up your peppers so they are standing upright. 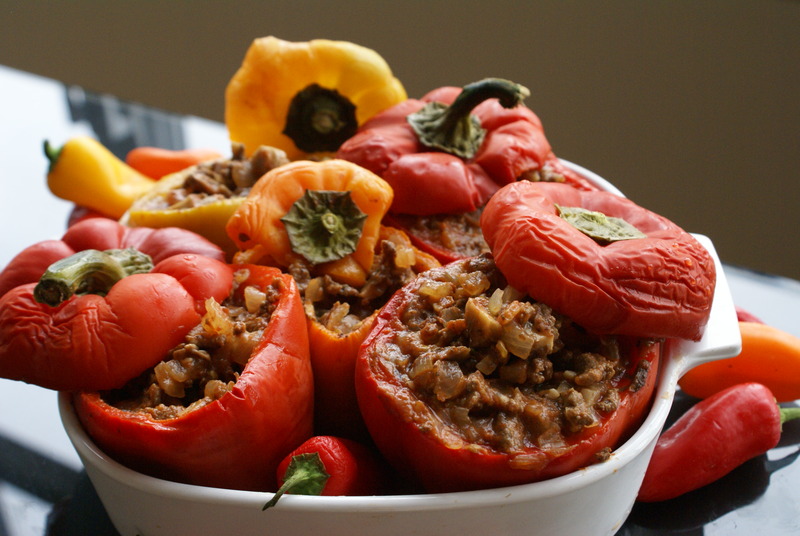 Fill in your bell peppers with the meat and vegetable mixture. Add 1/3 cup of water to the bottom of your baking dish. Place in oven and bake for 35-40 minutes (or even longer depending on how tender you like your bell peppers). You can serve immediately (but these are my favorite as leftovers). Enjoy! In a large mixing bowl, mix all ingredients together with a whisk – do not add the bananas until you have a smooth batter. Once your mixture is creamy smooth without any lumps, add in your diced bananas and slowly mix. 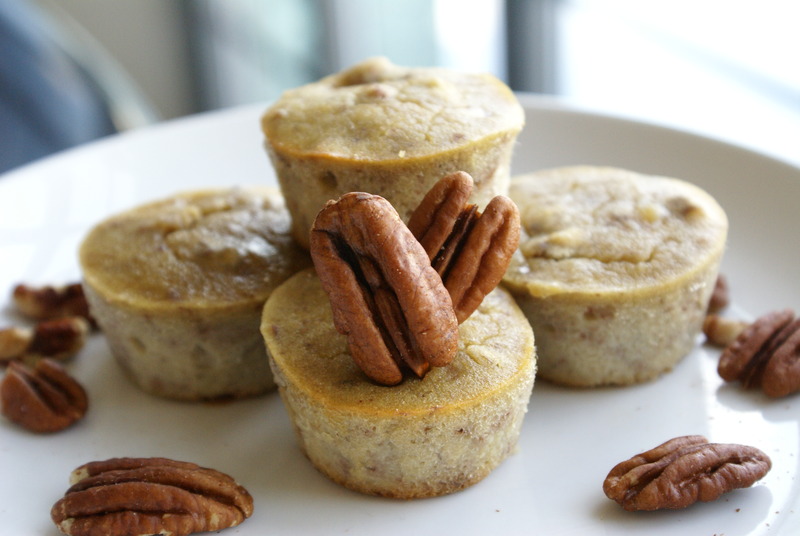 Pour the batter into muffin tins (I only have mini-muffin pans but use whatever you want!). Bake in the oven for 25 minutes. Serve warm or at room temperature. My husband liked this better than the banana nut bread I made awhile back. I think it’s because of the bite size nature of these mini muffins. Great for a light snack between meals or a dessert. Enjoy!